For years our shows have been considered THE place to find THE best products and services. Why? Our shows regularly draw from 800 to 1,700 brides, not to mention other members of the family and wedding party. The brides and their families attending our shows are buyers, not shoppers. Our professional and supportive staff. Social media marketing on all the top platforms. Radio on the top rated broadcast and internet stations on all major formats. Direct Mail to more than 3,000 brides. Digital advertising, including PPC, re-targeting and paid social media. Print, including posters and point-of-purchase materials at locations throughout the city and surrounding areas. The result is Central Texas’ largest and most trusted bridal event, reaching between 800 – 1,700 brides per show with a total audience of more than 2,000 ! 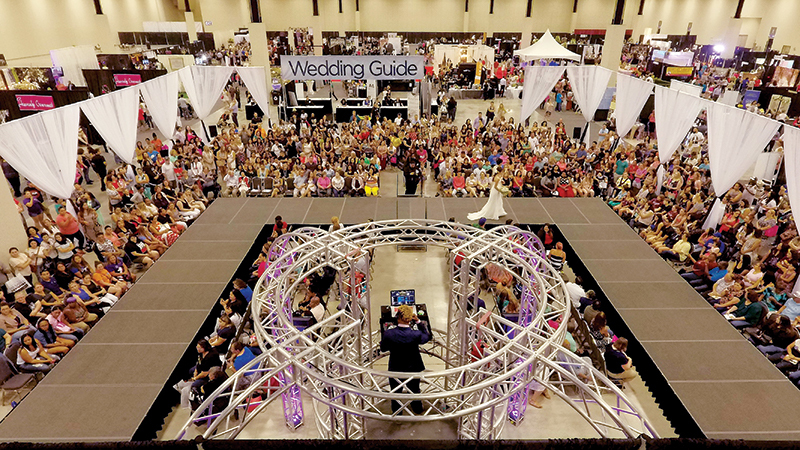 Since 1991, we have been producing the most comprehensive bridal showcase in Central Texas – the Bridal Extravaganza, featuring hundreds of displays from the finest wedding professionals in the area! Sunday, June 9, 2019 | Noon – 5 p.m.
Sunday, June 23, 2019 | Noon – 5 p.m.
Emailed directly to you, usually within 5 business days with all the brides’ contact info. Two hours of training prior to each show teaches you how to maximize your experience. Provide brides with an incentive to choose you and to make the choice quickly. Couples who book on the spot can win cash, encouraging them to make decisions.